Gottlieb Daimler was an engineer, industrial designer, industrialist, pioneer of the modern internal combustion engine and a workaholic before the term was invented. A persistent perfectionist, he drove himself and his co-workers mercilessly. Daimler was a cosmopolitan man, instrumental in founding auto industries in Germany, France and England. His core ability was engines, and he didn’t care whether they were powering cars, boats, trams, pumps or airships. He is also known for inventing the first high-speed petrol engine and the first four-wheel automobile. 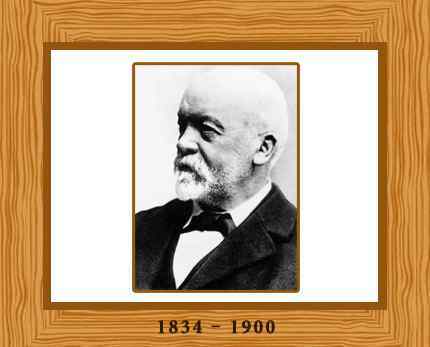 Gottlieb Daimler was born in Schorndorf in Germany on 17 March in 1834. His father wanted his son to become a municipal employee, but the young, mechanically inclined Daimler instead apprenticed himself to a gunsmith. After four years of his apprenticeship Daimler worked in a steam-engine factory and eventually completed his schooling at the Stuttgart Polytechnic. Daimler spent the next three decades working as an engineer and technical director of engine development for several companies. It was during this period that he worked with Nikolaus August Otto, the inventor of the four-cycle internal combustion engine, and Wilhelm Maybach, who become Daimler’s lifelong collaborator. Daimler’s and Maybach’s dream was to create small high speed engines to be mounted in any kind of locomotion device. They designed a precursor of the modern petrol engine which they subsequently fitted to a two-wheeler and considered the first motorcycle and, in the next year, to a stagecoach, and a boat. They are renowned as the designers of this Grandfather Clock engine. This helped push them ahead of other inventors who were emerging as competitors. In 1882 Daimler and Maybach set up a factory in Stuttgart to develop light, high-speed, gasoline-powered internal combustion engines. Their aim from the start appears to have been to apply these engines to vehicles. In 1890 Daimler and Maybach formed the Daimler Motoren Gesellschaft in Stuttgart, but they left the company only a year later in order to concentrate on various technical and commercial development projects. A Daimler-powered car won the first international car race–the 1894 Paris-to-Rouen race. Of the 102 cars that started the competition, only fifteen completed it, and all finishers were powered by a Daimler engine. The success of the Paris-to-Rouen race may also have been a factor in Daimler’s and Maybach’s decision to rejoin the Daimler Motor Company in 1895. In the following year, the Daimler Company produced the first road truck, and in 1900 the company produced the first Mercedes automobile (named for the daughter of the financier backing Daimler). The man who is widely credited with pioneering the modern automobile industry apparently did not like to drive and may never have driven at all. Certainly Gottlieb Daimler was a passenger in 1899 during a rough, bad weather journey that accelerated his declining health and contributed to his death the following spring of heart disease on March 6, 1900, aged 65 in Stuttgart, Germany, after a lifetime as an inventor in the forefront of automobile development. Daimler’s auto company merged with the Benz Company (also of Germany) in 1926, forming the Mercedes-Benz automobile company later.